I’m sharing a recipe today that was simply a result of wanting to use up some items that I had on hand, and these open faced asparagus sandwiches turned out so well that I thought you might like the recipe. The sandwiches would be ideal for brunch, lunch, or a light supper. 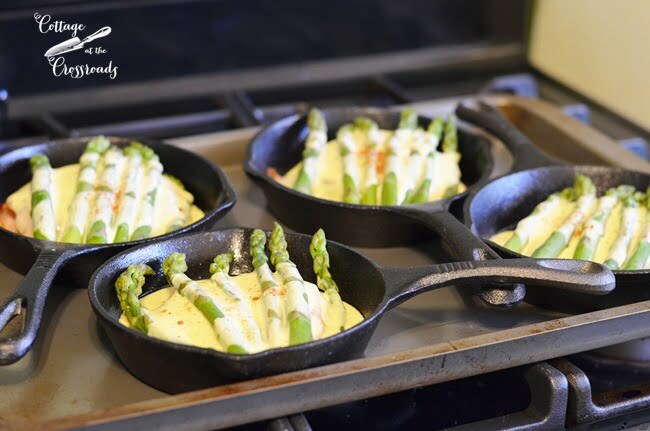 These open faced asparagus sandwiches look darling served in individual cast iron skillets. This all came about because I was being indulgent recently when I purchased some of these canned biscuits. You see, these biscuits are like crack for Leo and me. 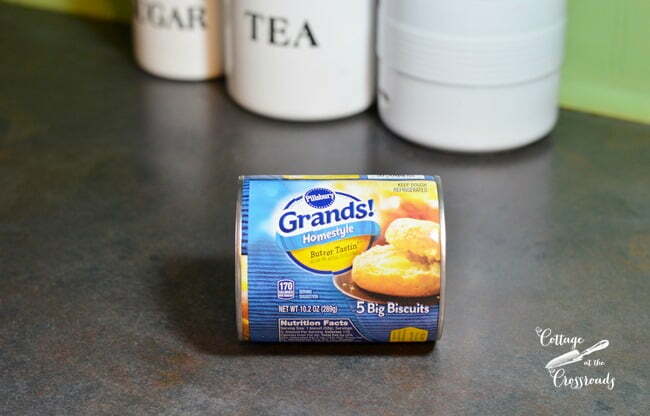 We like these for making egg biscuits for breakfast, but we have avoided these for over a year in our quest to eat more healthy. But I have found myself turning to comfort food to get me through the recent cold weather. Well, one morning we did have one egg biscuit each which meant that there were some leftover biscuits. So I put them in a baggie and refrigerated them for another use. So yesterday afternoon I pulled them out of the fridge along with some sliced deli ham and swiss cheese that we had and the thought of making some open face sandwiches occurred to me. So out came these little individual cast iron skillets that I had purchased months ago. They come preseasoned so I just added a small amount of olive oil to each pan and heated them up in the oven. 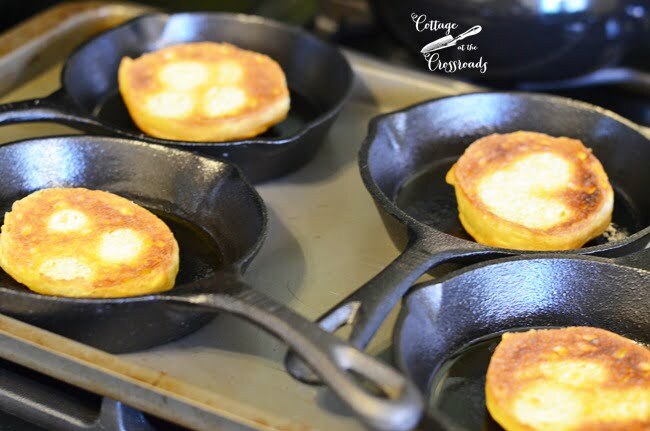 When they were nice and hot, I pulled them out and put a half of a biscuit in the bottom of each pan along with a few pats of butter and broiled them. I have found that these left over biscuits make great toast! Next I layered a slice of ham and a slice of Swiss cheese on top. So while rummaging around in the fridge, I pulled out some fresh asparagus spears, cooked them, and placed them on top of the cheese and stuck them back under the broiler to melt the cheese. Thinking that the sandwiches still needed a little something, I whipped us some homemade hollandaise sauce and poured it over the top along with a few shakes of cayenne pepper! Oh my! The hollandaise sauce was so rich and lemony and so, so GOOD! The great thing about making these sandwiches in these little skillets is that you can move them to the table to serve. If you notice, I made 4 of these sandwiches. Normally you would serve just one to each person along with some soup, salad, or fruit. But Leo and I were doing a taste test for you, dear readers! We ate all 4! So delicious and such a happy marriage of flavors! It was the hollandaise sauce that made them so terrific. 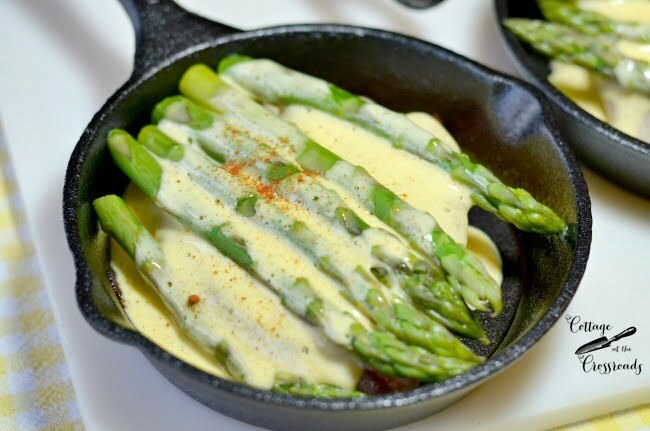 If you make these, don’t be tempted to use the packaged mix of hollandaise because it’s so easy to make your own and it is so much better! A quick and easy brunch, lunch, or light dinner dish! 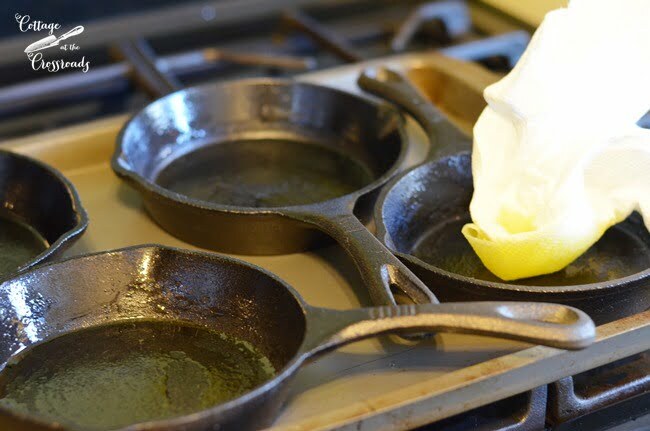 If using individual cast iron skillets, preheat in a 400 degree oven about 15 minutes. Cut the butter into small pieces, put on top of each biscuit half, and toast under the broiler, watching carefully to avoid burning the bread. Layer the slices of ham and cheese on top of each biscuit half. 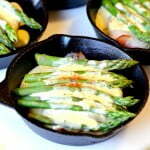 Place about 5 cooked asparagus spears on top of the cheese. 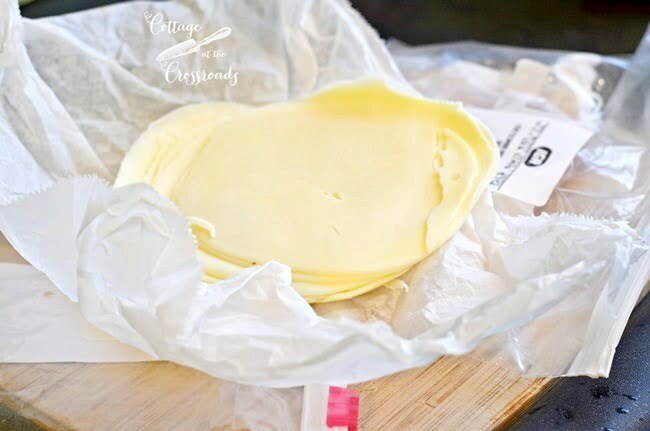 Broil on low until the cheese melts and remove from the oven. 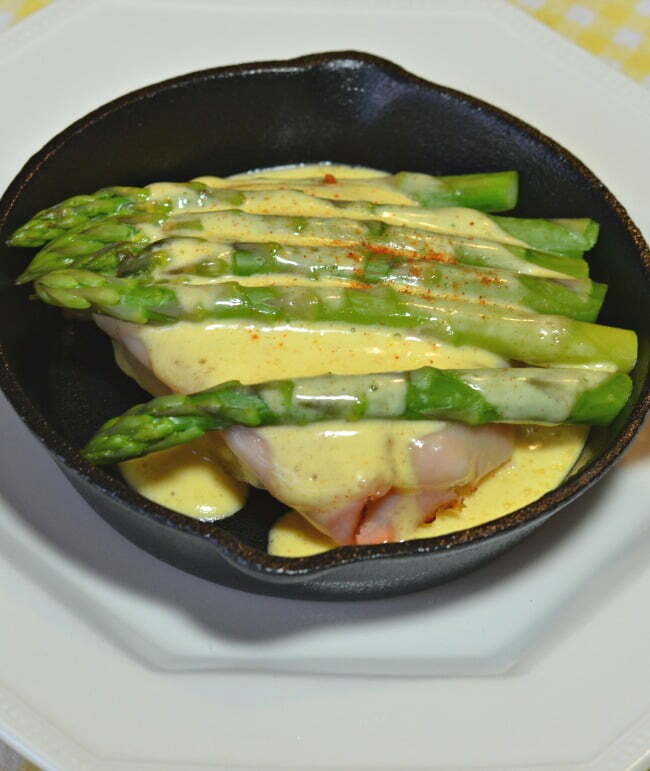 Pour hollandaise over the asparagus spears and garnish with a scant amount of cayenne pepper. Bring about 1 cup of water to a boil in a small saucepan. Separate the yolks from the egg whites and place the yoiks in a glass bowl that fits over the saucepan. Whisk the yolks and lemon juice together until they are thoroughly mixed. Place the bowl over the saucepan with boiling water, making sure that the bottom of the bowl does NOT touch the boiling water. Slowly pour in the melted butter and continue to whisk until the sauce is thick. 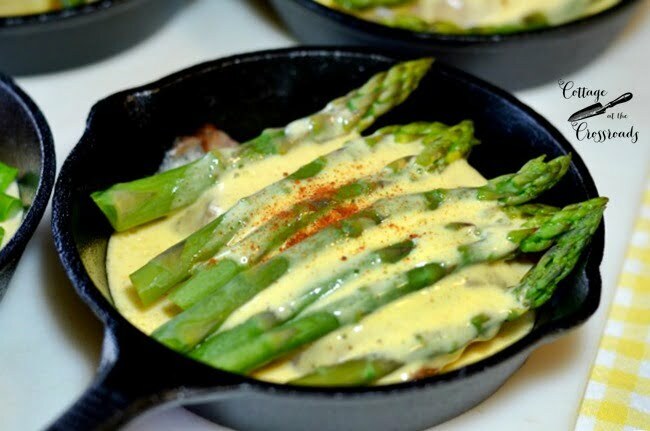 And you can bet that when we have some fresh asparagus spears from our garden, I’ll be making this dish frequently! Oh Jane these look and sound so yummy!! I have all of these ingredients in my fridge right now Jane! Those sound so delicious! Oh my, these look delicious! I pinned them to Pinterest, hope you don’t mind! (If you do, please let me know and I will remove.) Thanks for sharing! Oh my gosh…these look absolutely delicious….such a great meal with a salad and an oreo cookie for dessert!….So glad that you gave us the link to where we can purchased those great skillets….as I was planning to ask you and there you go as a good blogger letting us know where to get them!….Have a great day!!! This looks delicious. Love the homemade Hollandaise sauce with it. Thanks for the recipe. I’m definitely making this. YUM! I was so pleased that I could copy this recipe perfectly – now to get the ingredients and get them made. 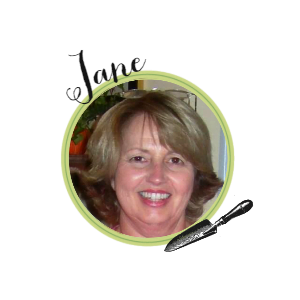 Thank you so much – Betty from Ontario,Canda. Yum! 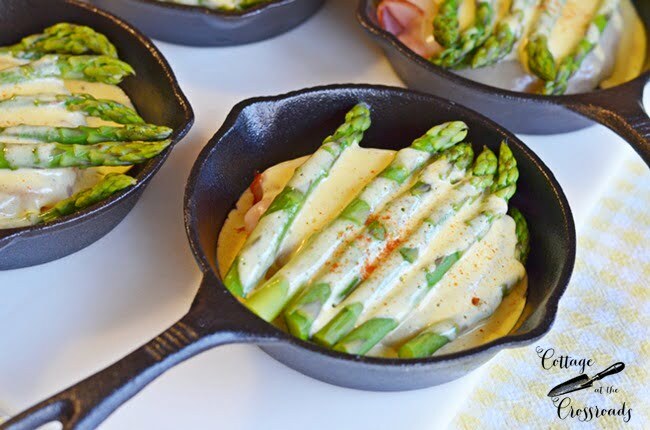 It looks delicious with the fresh green asparagus and melted cheese. We too have been trying to eat healthier. And biscuits are something I dream of. Yummy! This looks so good. I am addicted to those biscuits too. Have a great week. Yummy. Love all your posts!